Pubblicato in: Atti del XI Convegno Società Italiana di Archeoastronomia, Il dentro e il fuori del cosmo. Punti di vista per interpretare il mondo. Bononia University Press, Bologna, 2013, pp. 77-84, ISBN 978-88-7395-866-6. Printed in: Atti del XI Convegno Società Italiana di Archeoastronomia, Il dentro e il fuori del cosmo. Punti di vista per interpretare il mondo. Bononia University Press, Bologna, Italy, 2013, pp. 77-84, ISBN 978-88-7395-866-6. The Indus Civilization harbour-site of Lothal is located within a small doab created by the confluence of the Bhogavo and Sabarmati rivers about 30 km before their flowing into the Gulf of Khambhat and the Arabian Sea (Gujarat, India). The urban settlement (ca. 10 ha) consisted of an acropolis with the public and the ritual buildings and a lower town with the residential and the craft areas. A huge brick-lined water basin (220x40x4 m) - variously interpreted as a water supply tank or a dockyard - has been discovered immediately East of the site. The acropolis and the dockyard were built matching the four cardinal marks, while the lower town has different orientations. In our report we show and discuss the results of our astronomical surveys on these ancient architectures. The archaeological site of Lothal (22°31’22.97” N / 72°14’56.10” E) covers about eight hectares and was discovered in 1954, as the result of a systematic village-to-village archaeological survey of the Saurashtra-Kathiawar Peninsula in the State of Gujarat, India. The site is located on a natural elevation within the small doab created by the confluence of the Bhogavo River from North-West, and the Sabarmati River from the North, about 25 to 40 km (depending on the tide) before their present debouching into the Gulf of Khambhat. About one third of the site mound has been excavated and documented in detail by S.R. Rao the Archaeological Survey of India between 1955 and 1962. An enormous corpus of data about the structural setting of the site and its material culture has been published over almost thirty years by Rao in different books and papers, but mostly in the official report of the excavations, published by the Archaeological Survey of India in two separate volumes: volume 1, about the environmental context and the structural features of the site (Rao 1979), and volume 2, which illustrates in detail the material culture found at Lothal (Rao 1985). The excavations carried out by Rao disclosed an urban settlement clearly ascribable to the Indus Civilization, which flourished on a local pre-Harappan chalcolithic site (Rao 1979: 24-25). The site occupation was divided into two main periods separated by a short break. Period A is dated from about 2450 to 1900 BC, perfectly matching to Phases 3B and 3C of Harappa (Rao 1979: 28-33), while Period B was related to a Late Harappan occupation dated from about 1800 to 1600 BC (Rao 1979: 33-36). At Lothal, archaeologists found an ‘acropolis’ raised upon a system of artificial box-like platforms that supported the public and the ritual buildings, and a ‘lower town’ with the residential and craft areas. However, the most impressive structure is undoubtedly the huge baked-brick-lined water basin excavated by Rao immediately east of the site. According to the excavator (Rao 1979: 63-64, 123-134 and fig. 19), it was roughly trapezoidal, measuring 212.40 m on the western embankment, 209.30 m on the eastern one, 34.70 m on the southern one and 36.70 m on the northern one. The walls are about 1.80 m at foundation level and about 1.00 m at ground level, with the inner faces of the walls strictly vertical. According to Rao, a 12.20 m wide inlet was originally present in the northern embankment, while in a later stage it was closed and replaced by a 7.00 m wide one opened at the southern end of the eastern embankment. The debate about the function of this unique structure is still open and the different possible interpretations highly influenced several other central archaeological questions about the site. The basin was originally interpreted by Rao as a dock for small boats that reached Lothal from the Gulf of Khambhat through the Sabarmati-Bhogavo river system (Rao 1979: 125-134). This hypothesis was supported by several scholars. Later, other scholars considered it just a big reservoir for irrigation and/or drinking water, while others just rejected both theories without proposing any solid alternatives. In a recent paper, Rear Admiral Retd. S.C. Bindra (2003) evaluated all possible interpretations proposed of the Lothal basin in great detail. Considering the technical features of the structure and the rough environmental data available at the moment, he rejected the possible use of the basin for storing fresh water, in favor of its interpretation as an inland tidal dock (Bindra 2003: 16-18). The Bhogavo-Sabarmati tidal plain north of the Gulf of Khambhat, where Lothal is located, is a very dynamic geographical compound affected by heavy siltation, fluvial erosion and deposition. Consequently, the modifications undergone during the past five millennia may have considerably modified the coastal configuration and the main hydrological drainage system of the region (Khadkikar 2006; Khadkikar et al. 2004a; 2004b; Nigam 1988; 2005; 2006; Nigam et al. 1990; Nigam and Hashimi 2002). Moreover, a comprehensive detailed paleoenvironmental reconstruction has to consider also the particular features of the Sea level fluctuations in the area. The Gulf of Khambhat is, in fact, a macrotidal monsoonal system affected by a high tidal range that reaches up to twelve meters (Deo et al. 2011: 138; Nayak and Shetye 2003). The geomorphological framework is therefore of fundamental importance to validate Rao’s interpretation. The geographical and ecological evolution of the area was closely affected by the Holocene climate cycles that alternated periods of marine transgression and ingression, which determined a continuous shifting of the shorelines along the Bhogavo-Sabarmati tidal plain (Mancini et al. 2010). According to several scholars (Hashimi et al. 1995; Rao et al. 2003; Mathur et al. 2004), the sea level in the eastern Arabian Sea was ca. 70 m lower in 10000 BC, while in 7000 BC the level was comparable to the present stationing; from 7000 BC to 4000 BC, it maintained a constant relative rising trend with a climatic optimum around ca. 6000 BC, when the climate was characterized by high degrees of temperature and humidity (Nigam et al. 1990). During the second half of the 3rd millennium BC, the level of the Eastern Arabian Sea was ca. +2 m above the present mean sea level (Hashimi et al. 1995). Moreover, according to the study of paleochannels and paleodeltas identified from satellite images processing, the coastline seems to have run across the modern towns of Vataman, Moti Boru and Bholar, less than 10 km far from Lothal (Khadkikar 2006; Khadkikar et al. 2004a; 2004b). Other scholars, instead, stated that the maximum marine ingression occurred between ca. 4500 and 4000 BC (corresponding to the period of urban occupation at Lothal), with a sea level of ca. +6 m above the present mean sea level (Mathur et al. 2004; Gaur and Vora 2006; Gaur et al. 2007; Rao et al. 1996). However, such models might also be affected by recent tectonic movements in the region that suggest a possible uplift of the area from 2000 BC (Chamyal et al. 2003; Kusumgar et al. 1998; Mancini et al. 2010). On these bases, the ‘Lothal Revisitation Project’ was proposed to be carried out in direct partnership between the Department of Archaeology of the University of Bologna and the Archaeological Survey of India, Ministry of Culture, Government of India, with the technical collaboration of the Department of Earth Sciences and Environment of the University of Bologna, headed by Prof. Giovanni Gabbianelli. The Lothal Revisitation Project was mainly designed as a geoarchaeological project, combining remote sensing and field activities. In particular, non-invasive geophysical prospections have been proposed to detect different natural and artificial subsoil features, complemented by series of core-drillings to determine the shifting of paleochannels and shorelines (for the theoretical background of the proposed geophysical methods and examples of case-studies, see Campana and Forte 2006; Campana and Piro 2009; Khadkikar 2006; Khadkikar et al. 2004a; 2004b). The research program was designed to investigate in detail the comprehensive archaeological compound, including the urban settlement configuration and the surrounding environment, through a close and continuous interaction between archaeologists and teams of geologists, geomorphologists, geophysicists and other specialists of environmental sciences, in order to reconstruct the paleogeography around Lothal during the Late Mid-Holocene (ca. 3000-1000 BC) and the hydraulic structures that interfaced the site with the surrounding environment. The ‘Lothal Revisitation Project’ was also planned as a comprehensive program of mutual exchange with an intensive program of training, in order to activate the transfer of the most advanced and innovative methods and techniques for the application of remote sensing, digital documentation and geophysical prospections in archaeology through field activities, lectures and conferences. Moreover, special advisers with recognized experience in museum sciences, archaeological site conservation and design of open-air archaeological parks are continuously assisting the Indo-Italian team for specific actions. The urban settlement of Lothal (ha 10 approximately) consists of an acropolis with warehouses, public and ritual buildings and a lower town with the residential and the craft areas. A huge brick-lined water basin (m. 220x40x4) - variously interpreted as a water supply tank or a dockyard - has been discovered Eastward of the site immediately. A acropolis; B warehouse block; C water basin; D Lower Town. The following measures of azimuth have been taken since 5 to 14 February 2009, using the following tools: spherical surveyor’s cross with direct reading of 5’ centesimal, gravity inclinometer with direct reading of 1° degree, radio-controlled clock repeatedly compared with the Italian Master Clock I.N.RI.M., prismatic compass with direct reading of 1° and 0,5° estimated. azimuth E-W 88°58’ « 268°58'. azimuth E-W 89°28' « 269°28'. azimuth E-W 88°30' « 268°30'. azimuth E-W 91°49' « 271'49'. azimuth E-W 74°36' « 254°36'. It is sure that the axes which we measured in Lothal - except the low city - point to the four cardinal points with an average deviation (both eastward and westward) of 1.6° from the meridian. This little deviation coincides with Thuban’s (α Draconis) maximum digression in 2450 B.C. well enough. 3) warehouses’ boundary walls: 2°36’. The azimuth of the lower city is completely different: 12°48’ from meridian and 10°40’ from Thuban’s maximum digression. Certainly, the low city had no astronomical alignments. 4) using an artificial horizon to observe towards North the medium point of the rising and the setting of a circumpolar star (high accuracy) (Romano 1992, pp. 188-189). Methods No 1 and No 2 are almost inaccurate; this inaccuracy may be in accordance with a very different azimuth from 360°. Methods No 3 and No 4 have a good accuracy but in this case the azimuth of the alignments would be precisely 360°-180°. A difference between the meridian and the average alignments so similar to Thuban’s maximum digression and the presence of a polar star shows us a good evidence for alignments towards this polar star. As a result, either Lothal’s alignments – except the lower city – are quite random or the builders would point them northward using the contemporary polar star. Bindra S.C. (2003), Lothal: A Harappan port town revisited, in Puratattva, 33, pp. 1-22. Campana S., Piro S. (eds) (2009), Seeing the unseen. Geophysics and Landscape Archaeology”, Taylor & Francis, London. Campana S., Forte M. (eds) (2006), From Space to Place, in 2nd International Conference on Remote Sensing in Archaeology. Rome. Cerasetti B., Codebò M., De Santis H. (2013), Archaeoastronomical surveys in Turkmenistan, in Atti XI Convegno Nazionale S.I.A. Chamyal L.S., Maurya D.M., Raj R. (2003), Fluvial system of the dry lands of western India: A synthesis of Late Quaternary environmental and tectonic changes, in Quaternary International, 104, pp. 69-86. Codebò M. (2012), Il calcolo FK4 B1950.0 della precessione delle stelle, in Atti del XIII Seminario A.L.S.S.A. di Archeoastronomia, Genova. Deo S.G., Ghate S., Rajaguru S.N. (2011), Holocene environmental changes and cultural patterns in coastal western India: A geoarchaeological perspective, in Quaternary International, 229, pp. 132-139. Flora F. (1987), Astronomia nautica, Hoepli, Milano. Gaur A.S., Vora K.H. (2006), Ancient shorelines of Gujarat, India, during the Indus civilization (Late Mid-Holocene): A study based on archaeological evidences, in Current Science, 77, pp. 180-185. Gaur A.S., Vora K.H., Sundaresh C. (2007), Shoreline changes during last 2000 years on the Saurashtra coast of India: Study based on archaeological evidences, in Current Science, 92, pp. 103-110. Hashimi N.H., Nigam R., Nair R.R., Rajagopalan G. (1995), Holocene sea level curve and related climatic fluctuations for western Indian continental margin. An update, in Journal of the Geological Society of India, 46, pp. 157-162. Khadkikar A.S. (2006), Holocene evolution of the Mahi and Sabarmati estuaries. Northern Gulf of Cambay, Western India, New Delhi. Khadkikar A.S., Rajshekhar C., Kumaran K.P.N. (2004a), Palaeogeography around the Harappan port of Lothal, Gujarat, Western India, in Antiquity, 78, pp. 896-903. Khadkikar A.S., Basavaiah N., Gundurao T.K., Rajshekhar C. (2004b), Palaeoenvironments around the Harappan port of Lothal, Gujarat, Western India, in Journal of Indian Geophysical Union, 8, pp. 49-53. Kusumgar S., Raj R., Chamyal L.S., Yadav G. (1998), Holocene paleoenvironment changes in the lower Mahi basin, western India, in Radiocarbon, 40(2), pp. 819-823. Mancini F., Marcheselli G., Stecchi F. (2010), Dati satellitari e GPS nelle applicazioni archeologiche: Ricostruzione della paleo-geografia nell’area del sito di Lothal (Gujarat, India), in Atti della 13^ Conferenza Nazionale ASITA, Milano, pp. 1351-56. Mathur U.B., Pandey D.K., Bahadur T. (2004), Falling Late Holocene sea level along Indian coast, in Current Science, 87, pp. 439-440. Nayak R.K., Shetye S.R. (2003), Tides in the Gulf of Khambhat, west coast of India, in Estuarine, Coastal and Shelf Science, 57, pp. 249–254. 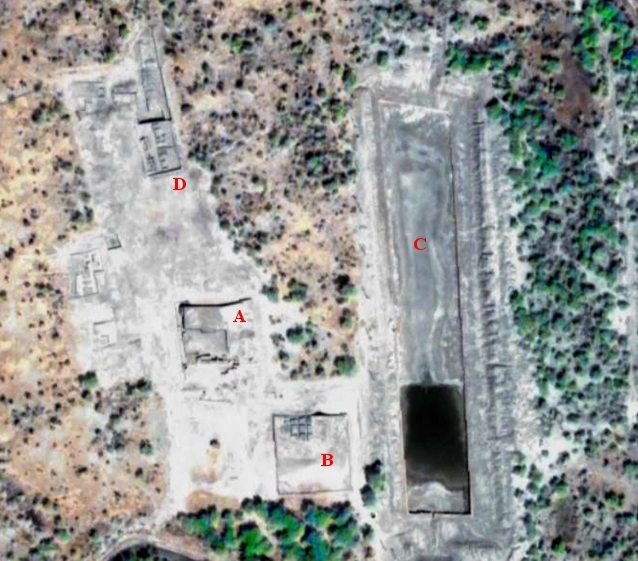 Nigam R. (1988), Was the large rectangular structure at Lothal (Harappan settlement) a ‘Dockyard’ or an ‘Irrigation Tank’?, in S.R. Rao (eds) Marine Archaeology of Indian Ocean Countries, Goa, pp. 20-22. Nigam R. (2005), Addressing environmental issues through foraminifera – Case studies from the Arabian Sea, in Journal of the Palaeontological Society of India, 50(2), pp. 25-36. Nigam R. (2006), Foraminifera [Marine Microfossil] as an additional tool for archaeologists - Examples from the Arabian Sea, in A.S. Gaur - K.H. Vora (eds), Glimpses of Marine Archaeology in India, Goa, pp. 94-99. Nigam R., Hashimi N.H., Pathak M.C. (1990), Sea level fluctuations: Inferences from religious and archaeological records and their oceanographic evidences, in Marine Archaeology, 1, pp. 16-19. Nigam R., Hashimi N.H. (2002), Has sea level fluctuations modulated human settlements in Gulf of Khambhat (Cambay)?, in Journal of Geological Society of India, 59, pp. 583-584. Rao S.R. 1979, Lothal: A Harappan Port Town (1955-62), in Memoirs of the Archaeological Survey of India 78, vol. 1, New Delhi. Rao S.R. 1985, Lothal: A Harappan Port Town (1955-62), in Memoirs of the Archaeological Survey of India 78, vol. 2, New Delhi. Rao V.M.P., Veerayya M., Thamban M., Wagle B.G. (1996), Evidences of Late Quaternary neotectonic activity and sea level changes along continental margins of India, in Current Science, 71(3), pp. 213-219. Rao V.M.P., Rajagopalan G., Vora K.H., Almeida F. (2003), Late Quaternary sea level and environmental changes from relic carbonate deposits of the western margin of India, in Earth and Planetary Sciences, 112, pp. 1-25. The first vertical is the great circle passing through the points East, West, Zenith and Nadir. sen Z = cos δ sec φ. Same orientations towards the four cardinal points and towards Thuban were found in two contemporary Turkmenian sites: Gonur-depe and in Togolok-21 (Cerasetti, Codebò, De Santis 2013). Please, read this report for more detailed discussion about this kind of settings in a row and the likelihood that peoples of the 4th – 3rd millennium BC know already the equinoctial precession.